It is a little-known fact that the Minister of Propaganda was opposed to a European war. He realized that Germany would be taking unnecessary risks and that her position of power would be weakened. Despite the victories of 1940 Goebbels said: “We must not fool ourselves. It will be a long and difficult war. Its outcome will not depend on boisterous victory parties but on a determination to do one’s daily duty.” He was probably the only Nazi leader to correctly judge the length and gravity of the war. 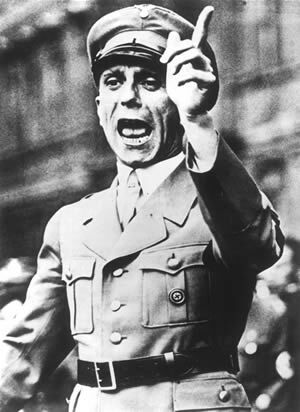 As the war turned against Germany, Goebbels now saw himself as a general, his ministry as a general staff and the propaganda war as important as that at the front. In Berlin in May 1945, in the bunker with Hitler, Goebbels and his wife Magda commited suicide. He shot himself while she took poison, then an SS orderly gave them the coup de grâce to ensure that the couple were indeed dead.